Experience the magic of Walt Disney World Florida. 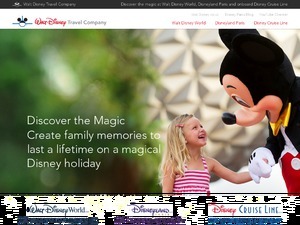 Plan or book Disney Holidays, Disney Tickets or Disney Hotels by visiting the Walt Disney Travel Company. Offer condition: Discount is available for bookings made between 4th March-6th April 2014 for qualifying hotel stays arriving 15 March-31st December 2014 and is subject to availability. Applies to new bookings only. Discount is valid for the accommodation/room portion of a Disney Hotel stay when booked: as Room only, as part of a Room and Ticket booking, or as a Flight Inclusive booking. 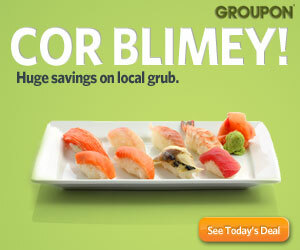 Discount does not apply to Good Neighbour/Non-Disney Hotels. Maximum stay is 21 consecutive nights. Discount can only be applied if the voucher code is entered or quoted at time of booking. Offer can be combined with 14 for 7 Disney ticket offer but no other offer. Do not miss another Walt Disney Travel Company Florida Holidays voucher! Simply leave your e-mail address and we'll always keep you informed of new vouchers for Walt Disney Travel Company Florida Holidays. Offer condition: for qualifying hotel stays arriving 15 March - 31 December 2012 and is subject to availability and applies to new bookings only. Discount is valid for the accommodation/room portion of a Disney On-site stay when booked: as Room only, as part of a Room and Ticket booking, or as a Flight Inclusive booking. Discount is valid for selected room types at one of the following participating Resort Hotels: Disney's All-Star Sports Resort, Disney's All Stars Music Resort, Disney's Pop Century, Disney's Port Orleans Resort - Riverside, Disney's Coronado Springs Resort, Disney's Port Orleans Resort - French Quarter, Disney's Beach Club Resort and Disney's Yacht Club Resort, Disney's Animal Kingdom, Disney's Saratoga Springs Resort and Spa and Old Key West. Discount is also valid for the accommodation portion of a Rental Home Stay, at one of our participating Rental Home Properties. Maximum stay is 21 consecutive nights. Discount can only be applied if the voucher code is entered at time of booking. Offer condition: Book now and save up to 30% on Disney Resort Hotels. Travel between 8 October - 22 December 2011. Up to 30% discount is only available on the accommodation portion of a Disney Resort hotel when you book either a Walt Disney World Hotel or a Walt Disney. Offer condition: Valid for travel between 5th July 31 December 2011.10% discount is only available on the accommodation portion of a Disney Resort hotel. Offer condition: For the following resorts only: All-Star Music Resort, Port Orleans Resort ? Riverside, Coronado Springs Resort, Port Orleans Resort - French Quarter, All-Star Sports Resort. Latest voucher code valid at a time of promo publication was entered to be working from 2014-03-04.